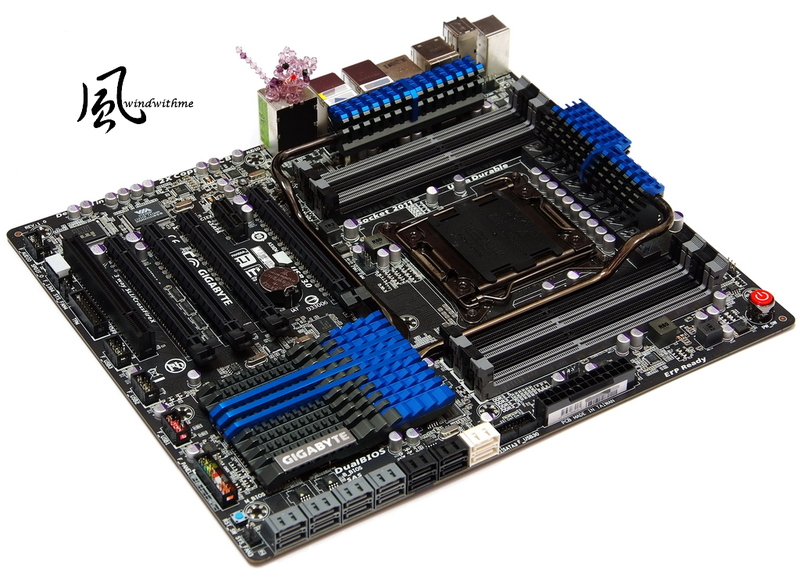 Intel launched LGA 2011Extreme platform at the end of 2011. It?s different position as annual renewed LGA 1155 or LGA 1150. LGA 2011 CPU refresh cycle is longer and having simple product line. CPU usually has 3 models. Mostly is using X79 chipset. 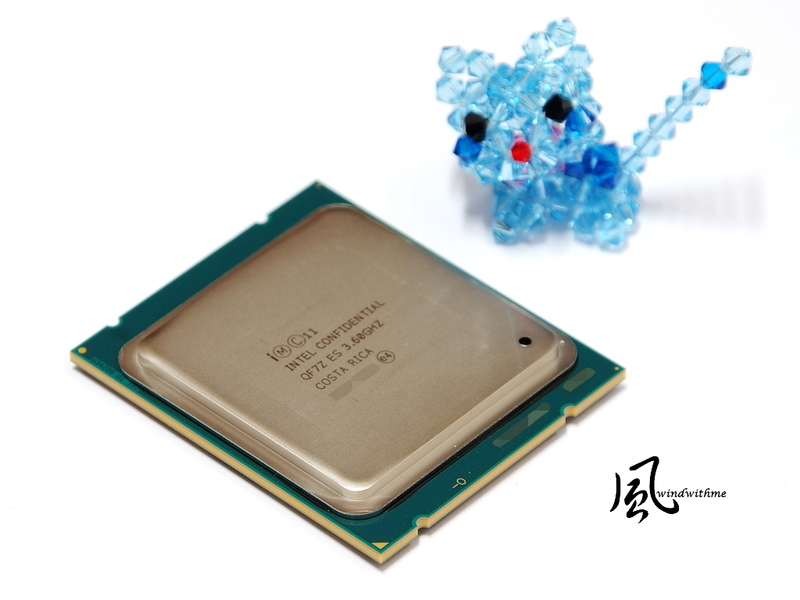 LGA 2011 launched three Core i7 CPU,Sandy Briidge-E, in the beginning. After almost 2 years, Ivy Bridge-E was revealed last Sep. The socket is LGA 2011. Pre-owned X79 users just need to update the BIOS. 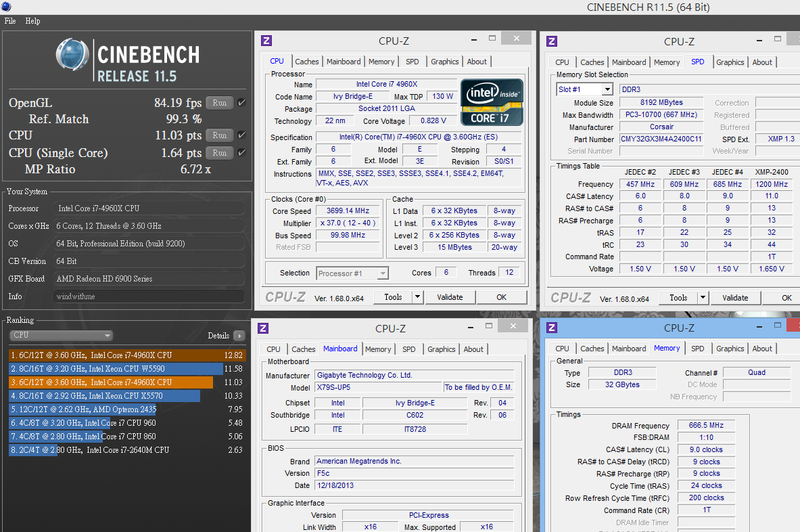 Sandy Briidge-E has 3 CPUs. Entry is Core i7-4820K,3.7~3.9GHz / 4C8T / L3 Cache 10MB. Even 4820is also Ksku. It should be able to adjust multiplier. 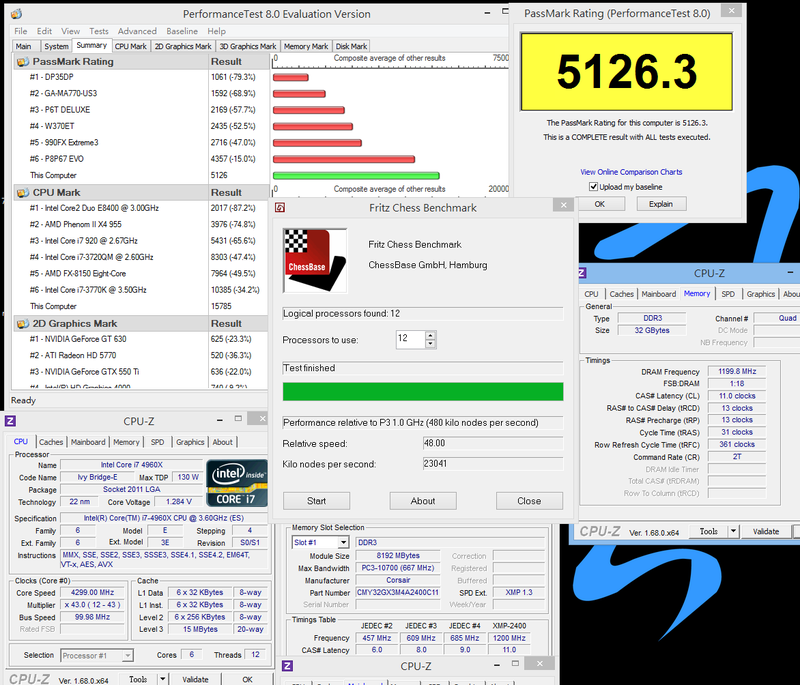 4820K is better than former i7-3820 at unlock geature. Sandy Briidge-E is 22nm and Max TDP is 130W. LGA 2011 doesn?t build in GPU, so the temperature and heat control should be better. Below is Intel Core i7-4960X, the dimension is much bigger than LGA 1155. 4960X back side is almost the same as 4930K. Main difference is 4960XL3 Cache is 15MB. MB is GIGABYTE X79S-UP5-WiFi, the only Intel C606MB so far. It?s E-ATX, 30.5cm x 26.4cm. Basically normal size ATX Case can support it. C606 is Server chipset. The CPU support is much better but OC capability will be weaker than X79. 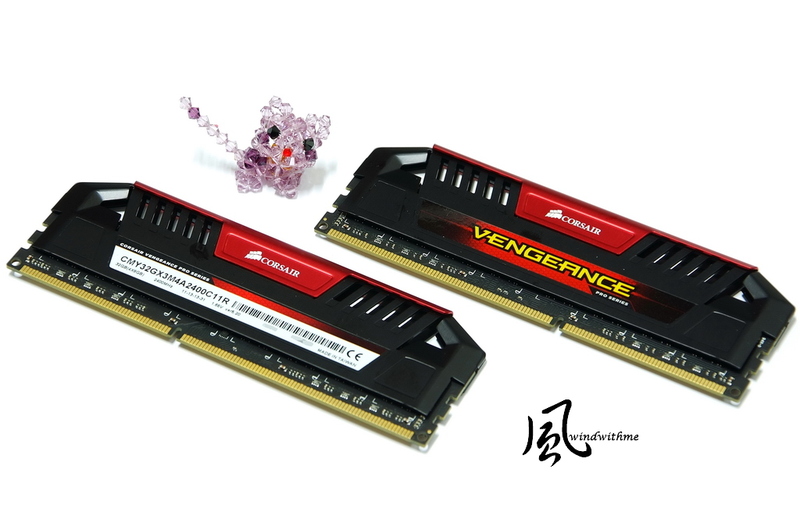 X79S-UP5-WiFi supports 8DIMM DDR3, and max capacity is 64GB. It supports 2SATA3 and 8SAS devices. It?s good for more HDDs or RAID. Unless you are using 3 SATA3 SSD, otherwise 8 SAS ports still provide a better expandability. After all, HDD still cannot break through SATA2 bandwidth. As i7-4960X test figure will divide into two. Picture A is default, enable C1E mode. CPU max clock is 3.6~4.0GHz, and DDR3 1333 CL9 9-9-24 1T. Picture B is OC, disable C1E mode. 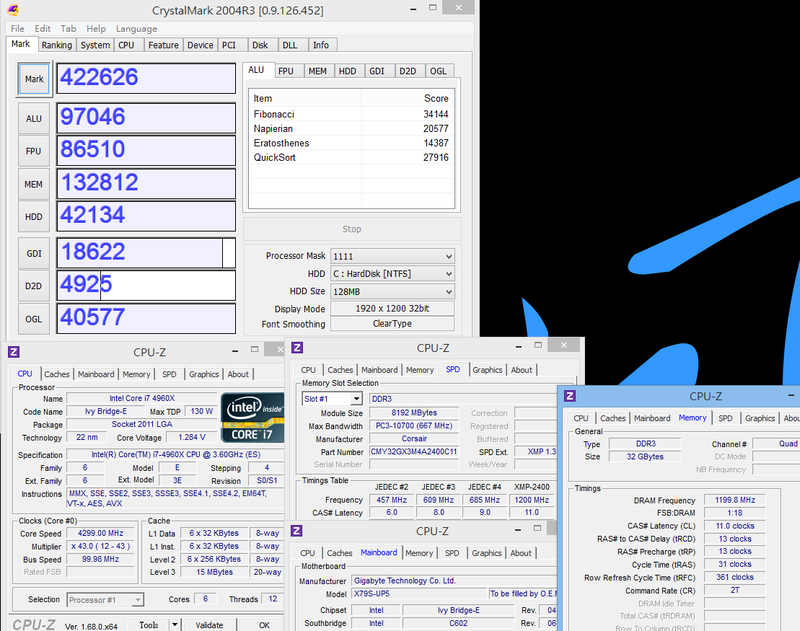 CPU clock is 4.3GHz, and DDR3 2399.6 CL11 13-13-31 2T. LGA 2011 is the only quad channel supported platform. It?s a great advantage for DDR3 bandwidth. 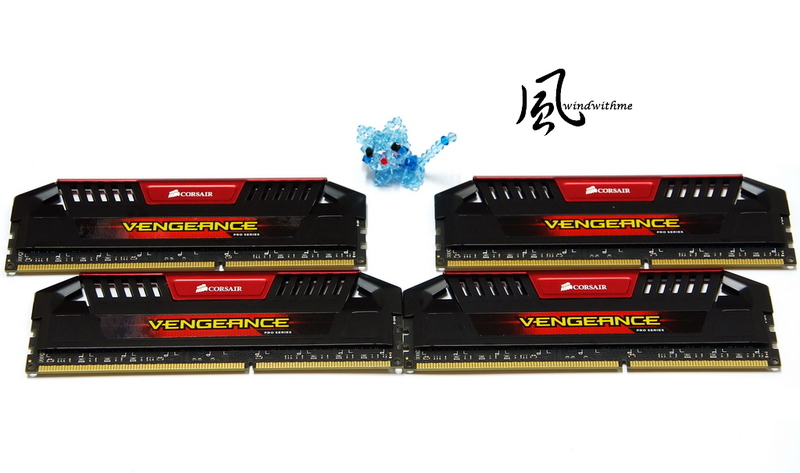 DDR3 is CORSAIR CMY32GX3M4A2400C11R, Vengeance Pro series. 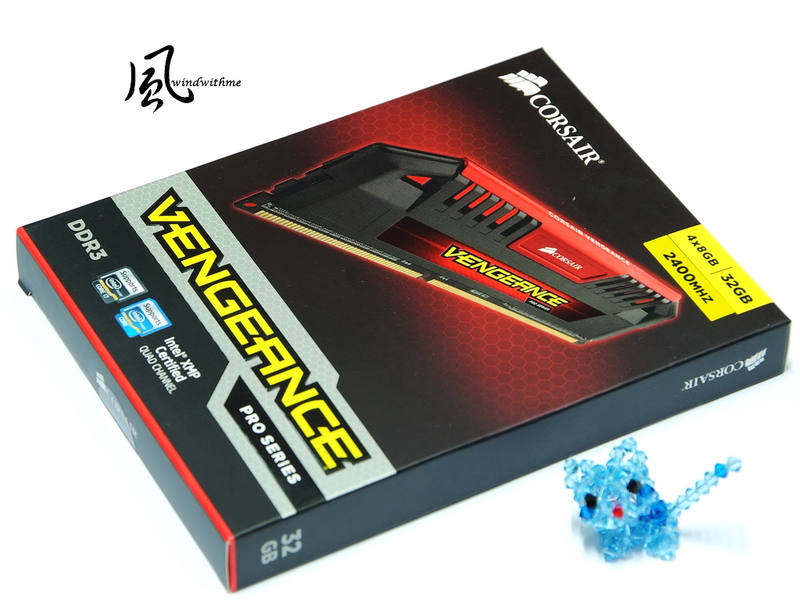 8GB X 4 support LGA 1155/1150 dual channel and LAG 2011 quad channel. I will also show you the quad channel and dual channel bandwidth performance. The clock is DDR3 2400. 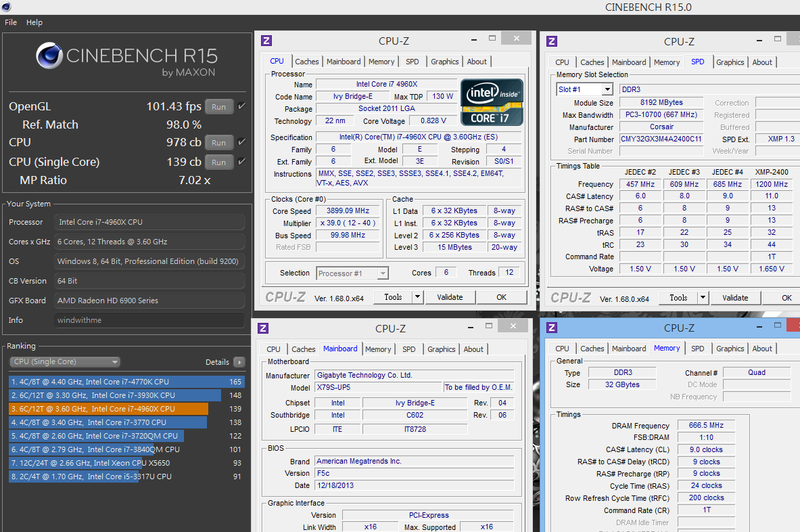 If it?s LGA 1155Ivy Bridge, the max can be over DDR3 2800. MaXXMEM Memory seems doesn?t support quad channel. The bandwidth is even lower than dual channel. I hope it can patch to support quad channel soon. The other two software can test the quad channel bandwidth. Ivy Bridge-E quad channel DDR3 1333 bandwidth is higher than Haswell DDR3 2400. 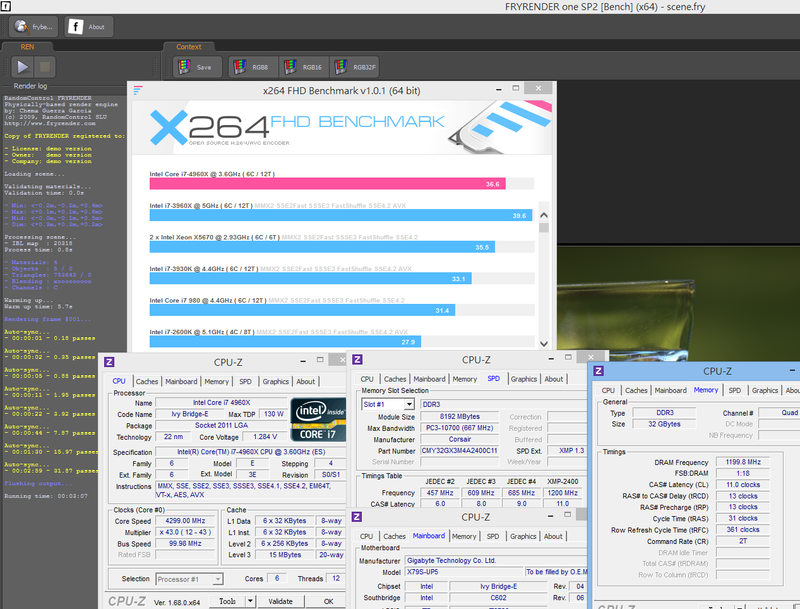 Ivy Bridge-EDDR3 2400 is 61~67% higher than Haswell DDR3 2400. 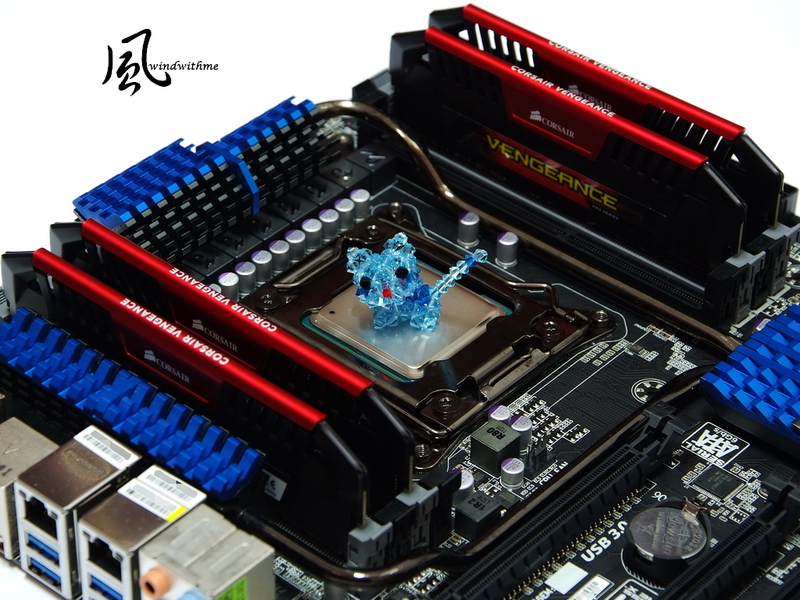 You can see if you need more DDR3 capacity or high bandwidth, LGA 2011 is your best option. 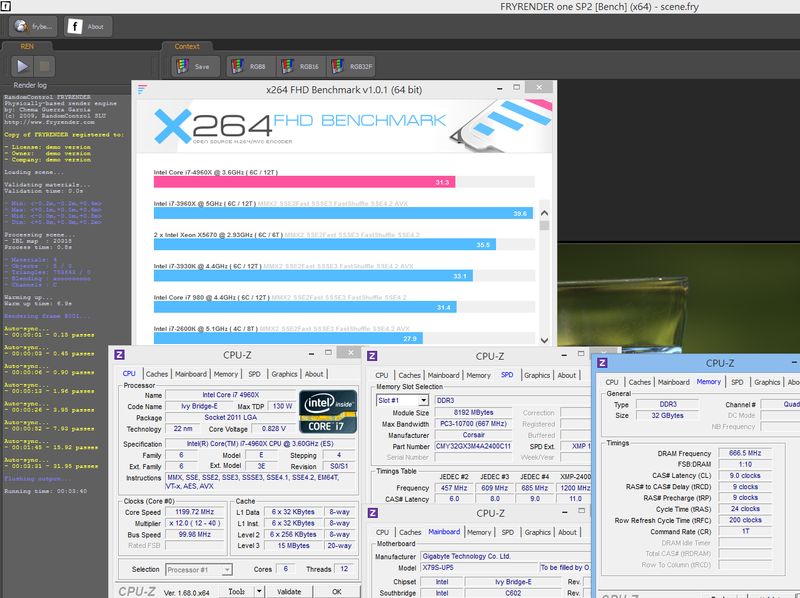 i7-4960X is a true most powerful multitasking CPU in Intel. The default performance is already high. 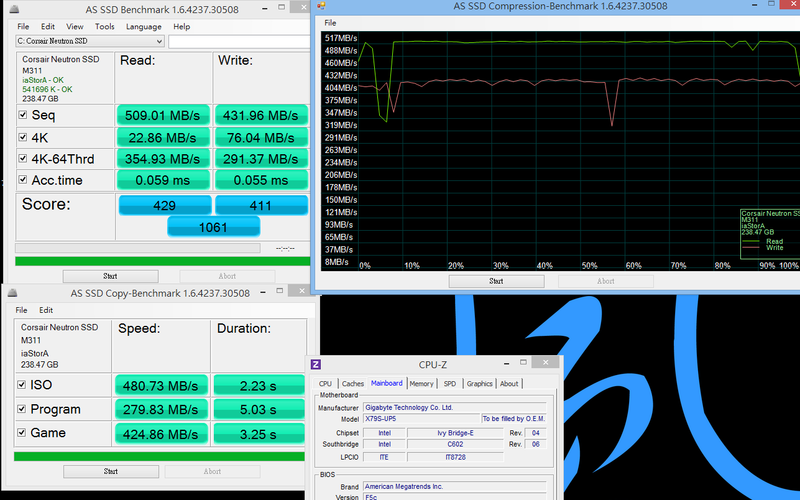 Even the latest Haswell i7-4770K OC to 4.5GHz, the performance is still 13% lower than 4960X default setup. Comparing to default and OC to 4.3GHz multitasking performance, the improvement is around 17~20%. Unfortunately, C606 OC capability is not as good as X79. If you use X79, it can be OC to 4.5~4.6GHz. This is another key point. 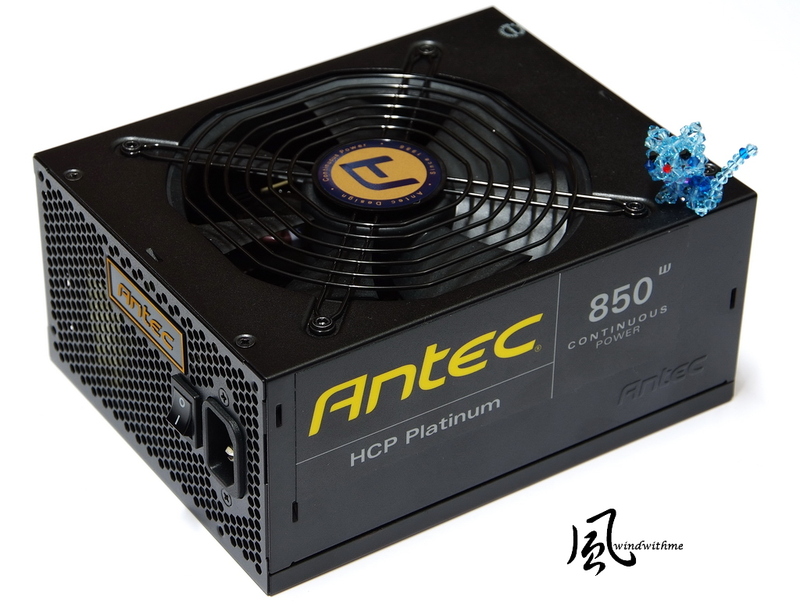 I use ANTEC High Current Pro 850W,80Plus Platinum, the power efficiency is 94%. 12V divides into 4 routes. Each route can support 40A. The total power supply is 850W. 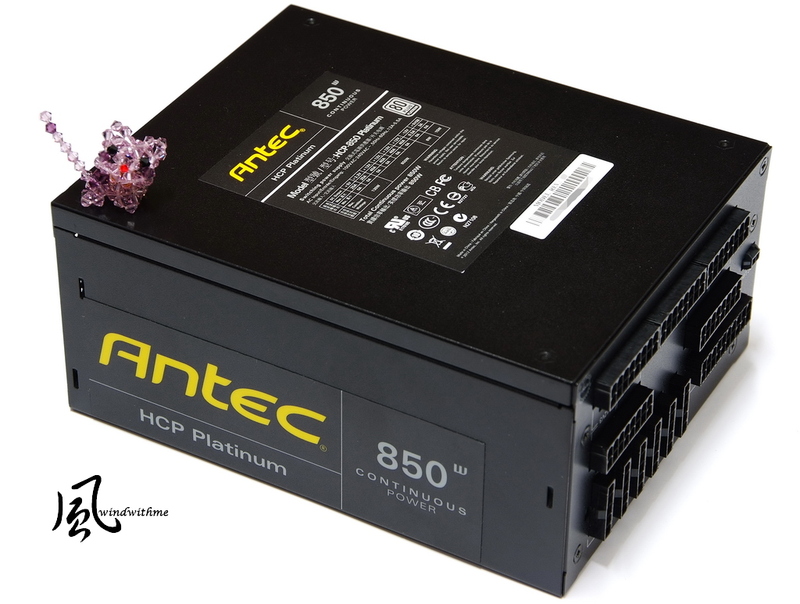 High Current Pro 850W Platinum certificate Power Supply has official 7 years warranty. Default at OS desktop without running any software, and enable C1E power saving technology - 77W. 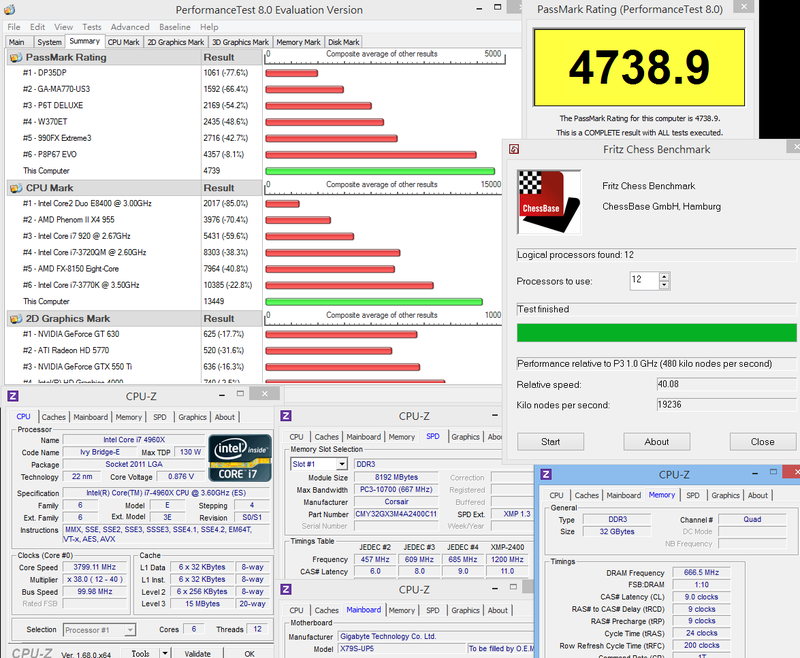 Comparing to former i7-3960X power consumption data, i7-4960X is a bit lower. 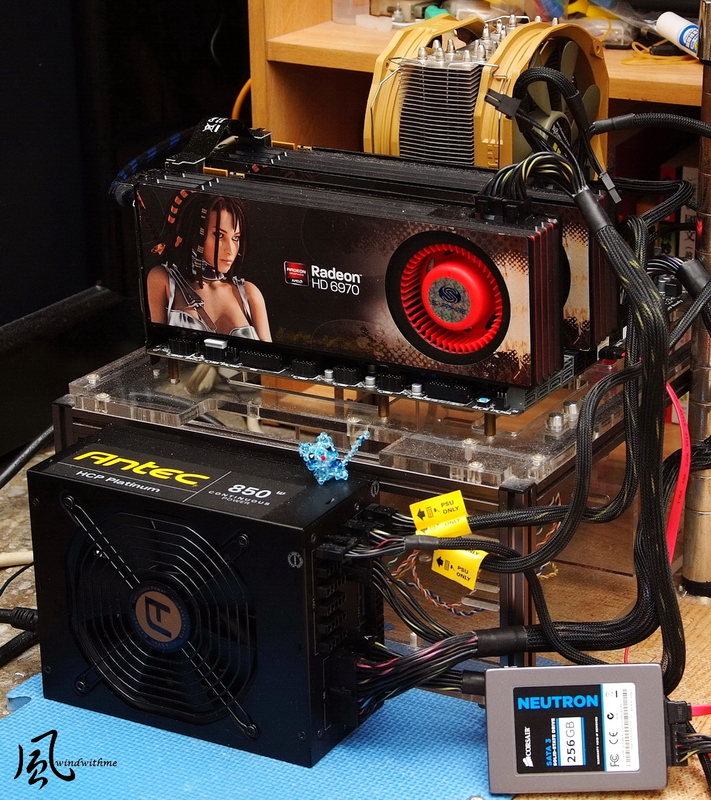 4960X is with Raden HD 6970 CrossFire, but 3960X is with single Nvidia GTX 560Ti. 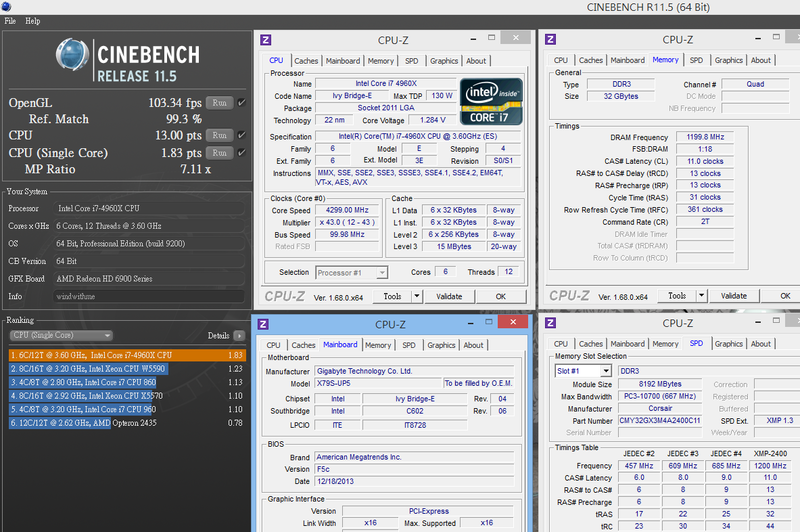 Especially after OC, 4.3GHz 4960X doesn?t like 4.5GHz 3960X to reach more than 300W. 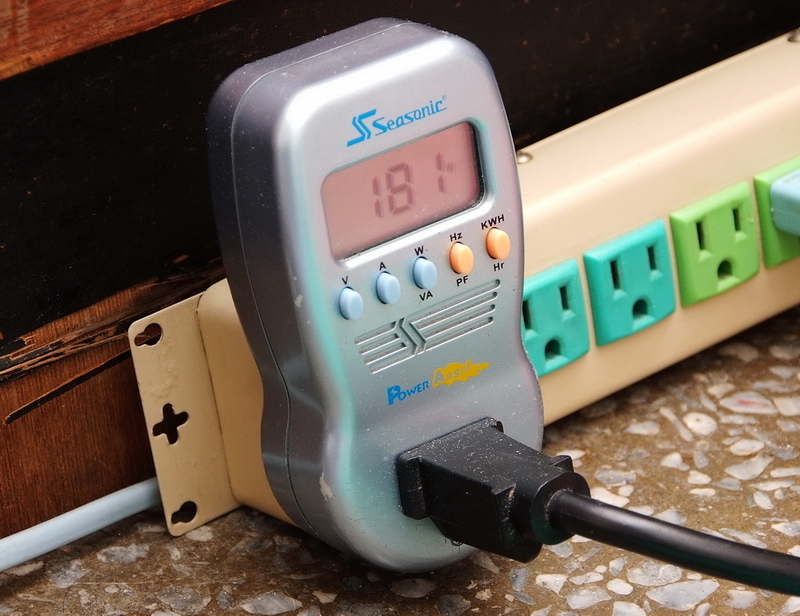 Of course Platinum Power Supply is also helpful. However, the main reason is Ivy Bridge-E move to 22nm. OC and default temperatures are similar. It?s a great performance. 4960X temperature is also good. 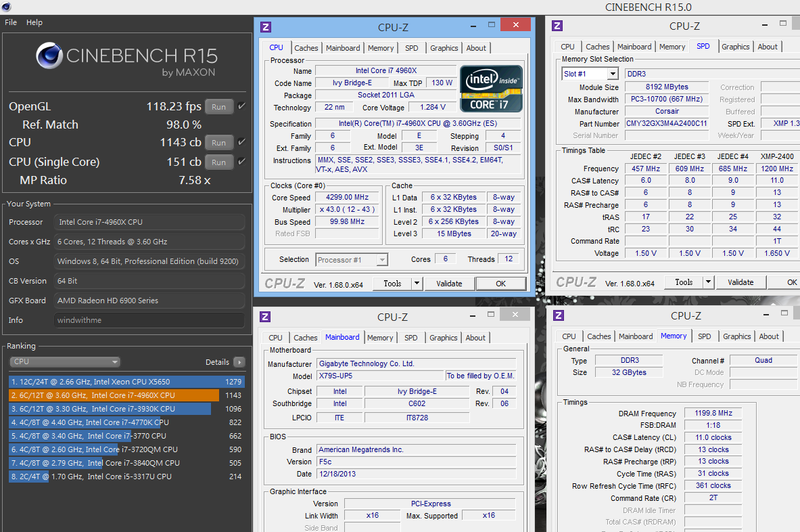 In the same environment, temperature is much lower than Ivy Bridge4770K. 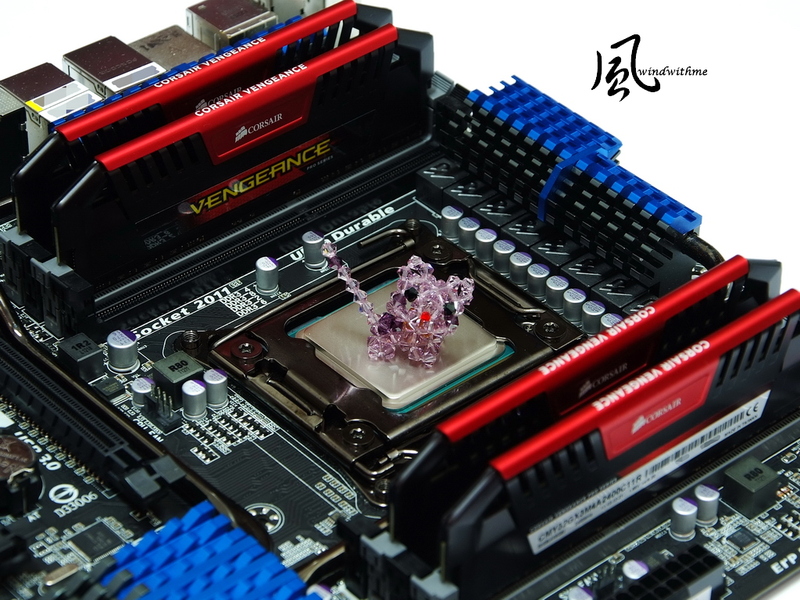 CPU temperature is one of the LGA 2011 advantages. It?s same structure but different design. The possible reason is LGA 2011 CPU without GPU and CPU dimension is bigger. X79 and C606 both support 2 native SATA3 ports. I use CORSAIR NEUTRON 256GB to test the performance. NEUTRON has 2 types. More high-end one is NEUTRON GTX, outlook is red. 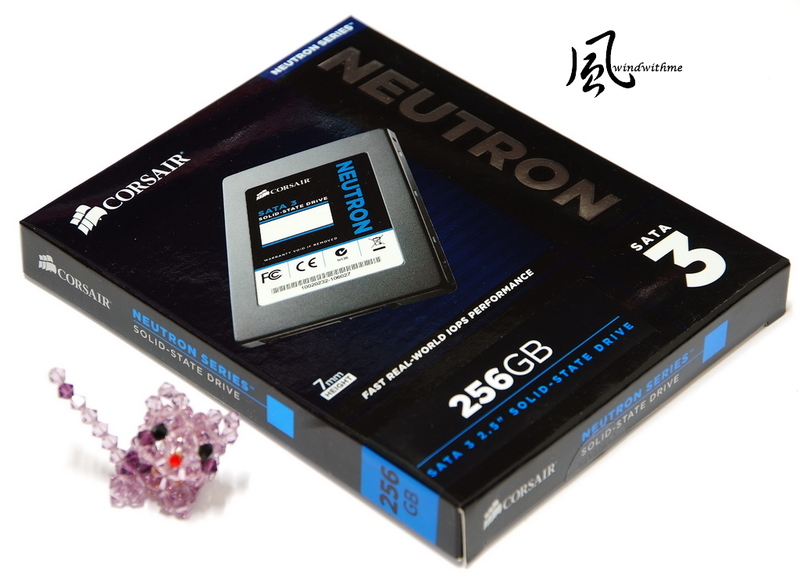 In the picture, the blue version is NEUTRON 256GB. Thickness is 7mm. It?s 2.5? and 256GB capacity. 4K Max Random is 83k IOPS. 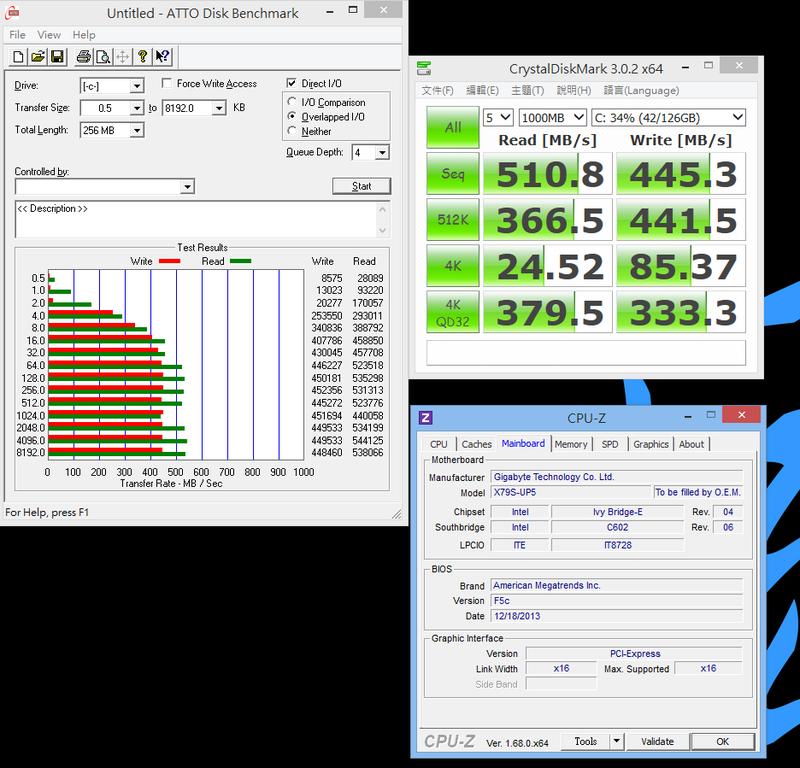 ATTO Disk Benchmark can reach 540/450 MB/s. 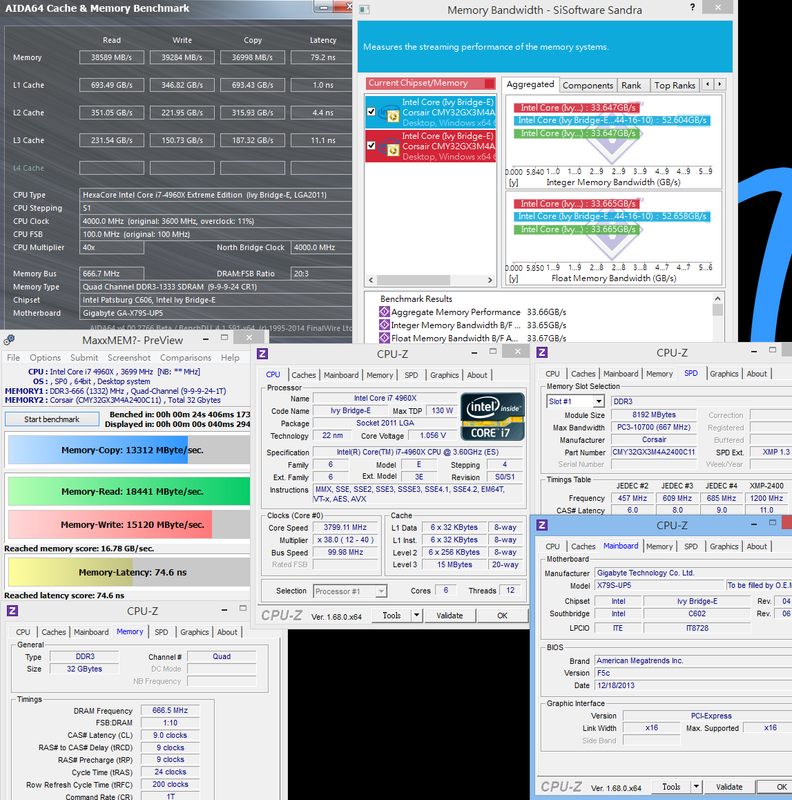 Neutron uses Link_A_Media LM87800 Controller with ONFI NAND Flash. Over 64KB test, the max read is 544.1 Mb/s and max write is 452.3 MB/s. Neutron performance is also good. Only 10% lower than Neutron GTX. By the way, LGA 2011 provides two SATA3 ports, you can use RAID 0 SSD to enhance the performance. 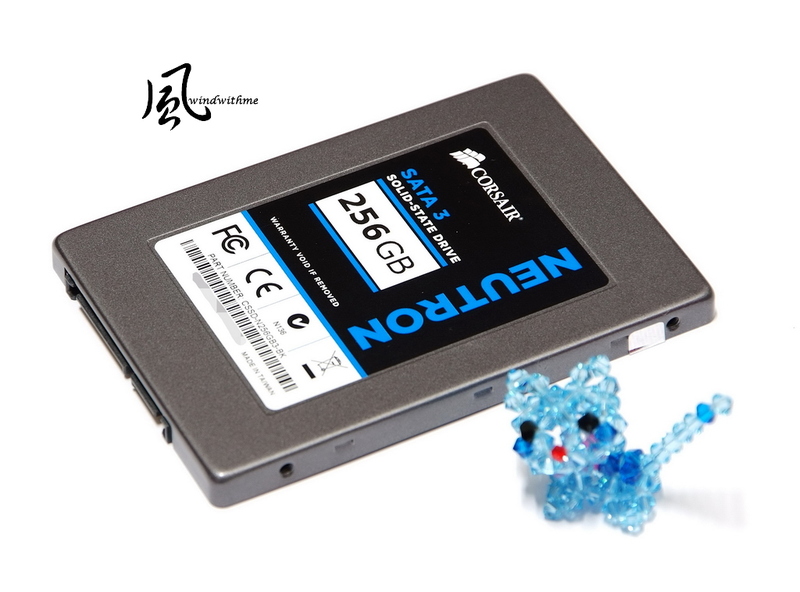 Other SATA2 or NS devices, you can use HDD to store data. It should be enough for most application. 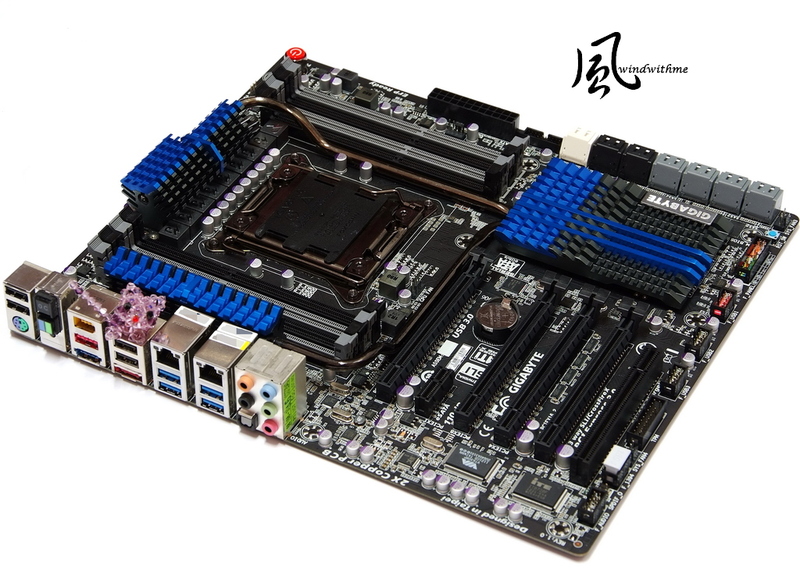 If you need more than three SATA3 SSDs, you can choose LGA 1150 for more ports. However, LGA 1150 has no dual PCI-E X16 bandwidth, and 6C12T CPU. Every platform has its pros and cons. After IntelLGA 2011 platform launched 2 years, they refresh the 3 new CPUs. Original Sandy Bridge-ECPU enhance to Ivy Bridge-E. 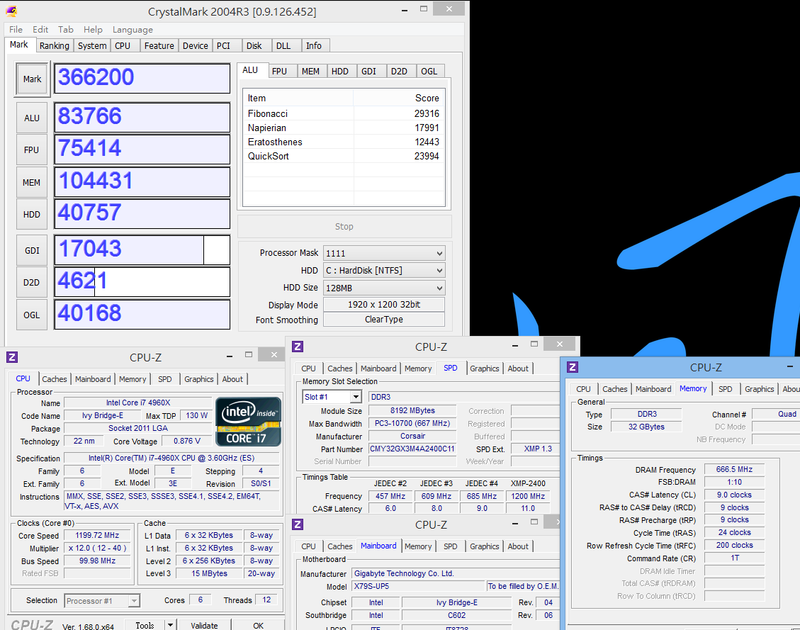 The entry i7-3820 also upgrade to i7-4820K as unlock version. It makes better C/P. 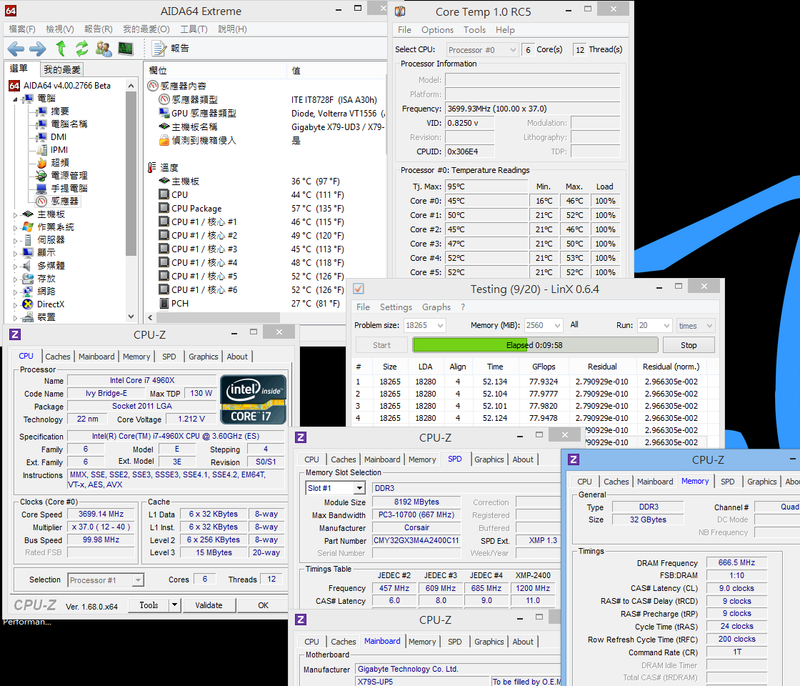 Ivy Bridge-E in manufacturing, temperature, power consumption and DDR3 OC bandwidth are all improved. Quad channel DDR3 bandwidth, dual PCI-E X16 bandwidth and C606 supports Server CPU also create more advantages. The fly in the ointment is only 2 native SATA3 ports. Hopefully, next generation will solve this issue. LGA 2011 platform is the top of pyramid. It?s for few high budget users. 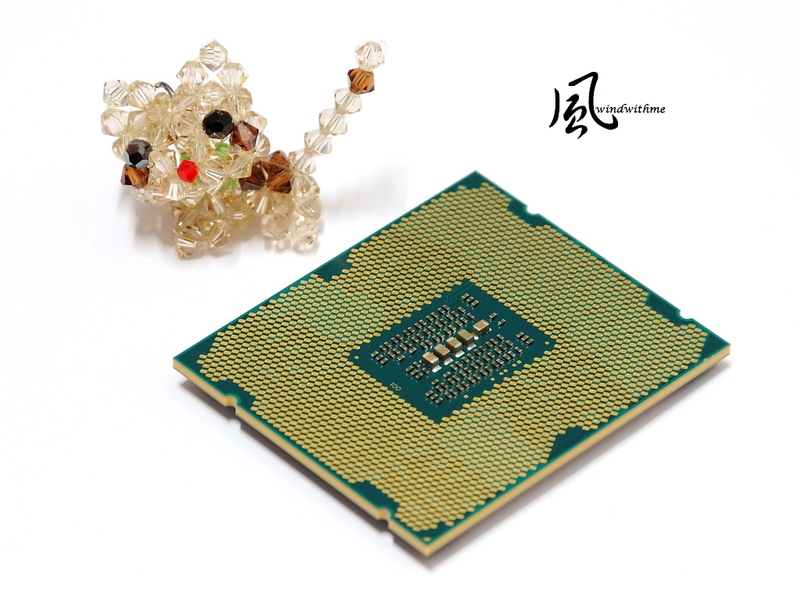 The life cycle is 3 years which is longer than annual update LGA 1155 or LGA 1150. Ivy Bridge-E offers the upgrade option for current LGA 2011 users. It also provides better multitasking performance. If you are doing graphics design, file converting or video editing, of course higher budget, this is the platform for you. It?swindwithme guide and share about Intel Ivy Bridge-E structure.